The mysterious skin behind Fortnite’s Road Trip challenge has been revealed and players can already unlock it. Following the announcement of update 5.30, Fortnite Road Trip skin has been revealed out with a few additional cosmetics. Epic Games took a step further after successfully starting the latest update for gamers to download. The latest version features the Rift-To-Go segment and adds up the Score Royale LTM. The Week 7 Challenges will go live - at 2 PM BST today. After the Fortnite 5.30 update was released early morning on August 23, fans started searching around the files on the game. This led them to find the leaked skins. Among other things, the Fortnite Road Trip skin was the most relevant and popular thing which they found out. For the readers who are not up to date, the skin will be unlocked as soon as each of the weekly Road Trip challenges inside the season 5 is completed. 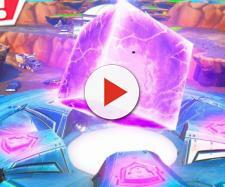 This might remind people about the Fortnite season 4, which had the same set of weekly Blockbuster challenges with the Visitor skin being the ultimate prize. As a matter of fact, this concluded by possessing a crucial position in the season 5 because the Visitor ended up being the one who propelled the Rocket during season 4 conclusion. As reported by the Express, the subsequent rocket launch generated the enormous rift in the "Fortnite Battle Royale" sky. It should be noted that Battle Royale sky has been important to the fifth season's ‘Worlds Collide’ theme. The question that would be rising the minds of a lot of people is whether the impact of Fortnite season 6 will be affected by the revelation of the Fortnite Road Trip skin. According to the Express, The character of the Road Trip dons an implicitly all black gear with a grey and silver chest plate. The ominous-looking Road Trip skin also has bright blue eyes alongside a silver/grey mask concealed by a black hood. The skin which succeeded the Visitor is expected to be successful among the fans of the "Fortnite Battle Royale." There is a catch obviously, a few of the committed Fortnite fans will be able to unlock this. In order to secure the "Fortnite Road Trip" skin, one has to complete and finish the weekly challenge across seven weeks in the Battle Pass. To simplify it, one first needs to buy the Battle Pass even to have a shot at getting the skin.